I've found that red and black and almost any other color produce a winning combination. hot pink, maroon, violet or purple. 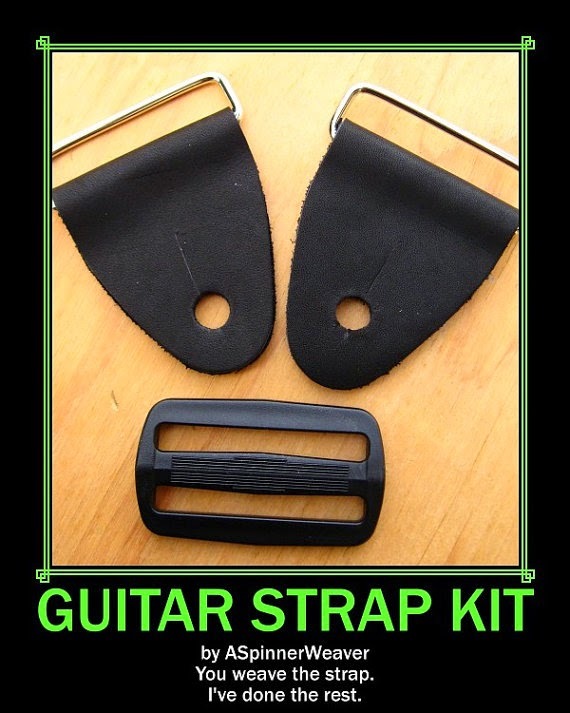 If used in the right ratio these can produce stunning effects! 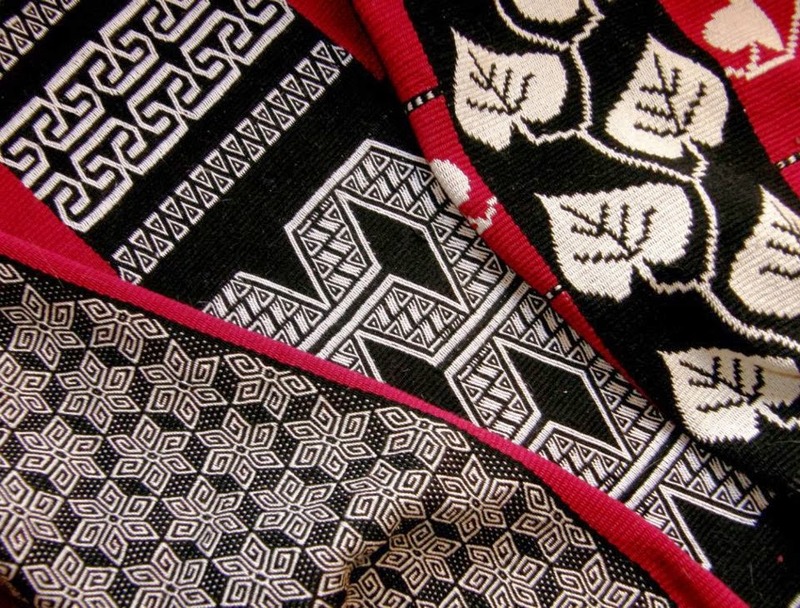 Think of how many times you've seen red and black used in beautiful combinations in Navajo rugs. play a strong role. You can see them here. This Ganado round piece hangs on the wall in my dining room. 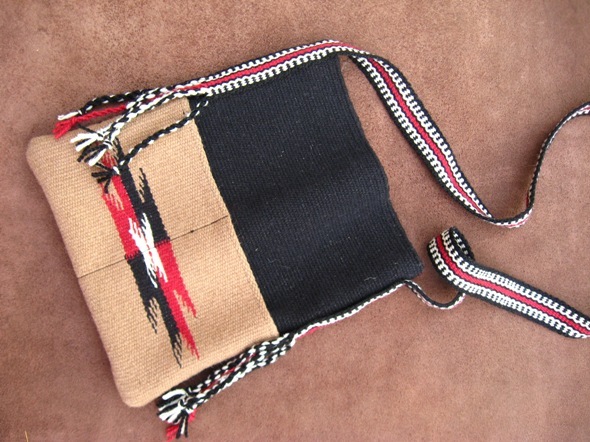 In these two wool purses from Chimayo, New Mexico red and black also play a key role. 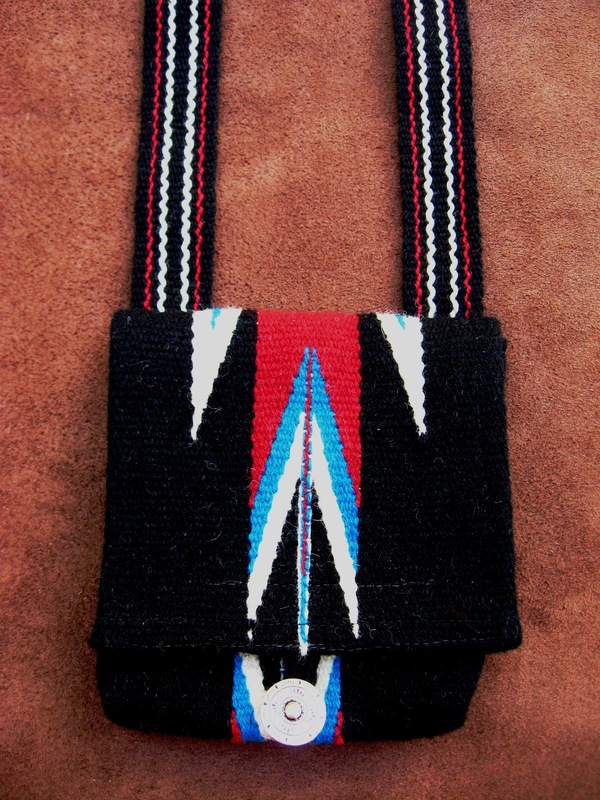 These were purchased from weaving shops in Chimayo and then I added my own woven straps, made to match. 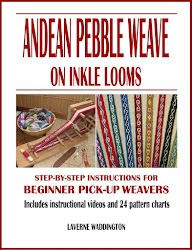 Laverne Waddington cites several weaving traditions for giving her the inspiration to do a lovely series in red, black and white. She says that her first inspiration was probably back with her first weaving experiences when she made a Navajo Storm Pattern piece. She has also long admired the combination in Bedouin textiles and her Montagnard teachers used it a lot. 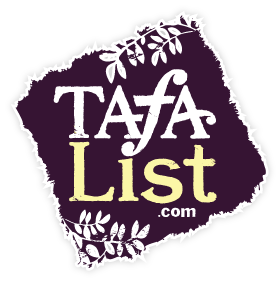 In this post, she talks some about the inspiration for this combination. These patterns, while they all share the color combination have a wide range of inspirations for the patterns. The lower one of stars came from spending time at Lake Titicaca, Peru where the stars filled the night sky, the center one, has motifs from the Wayuu culture of Colombia and Venezuela and the top one inspired by "chamantos", ponchos used by the "Huaso" (Chilean cowboy). 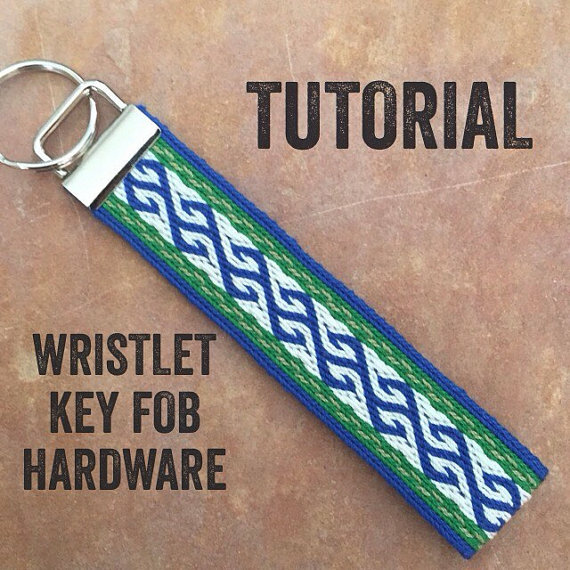 The motifs represent the rich agriculture and horse culture of the central part of Chile...wine producing area. 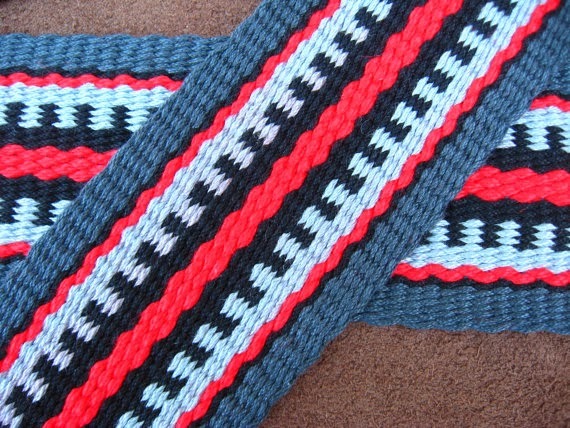 red and black with a green border stripe. I love this shawl I purchased from the weaver, Mercedes, in Santiago Atitlan, Solola, Guatemala. 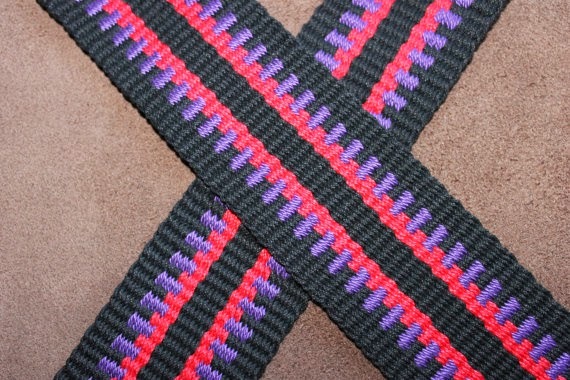 I used the same color scheme in this guitar strap (minus the tiny bit of white). Santa Cruz County Art of Guitar Festival. 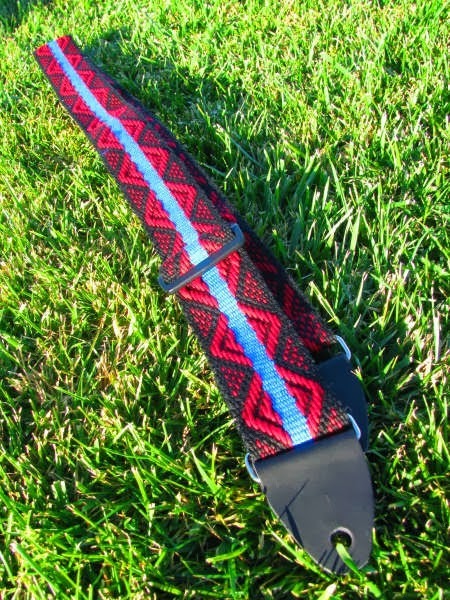 This is one of my favorite guitar straps of all times using the bright turquoise in the center surrounded with a heavy dose of black and red. 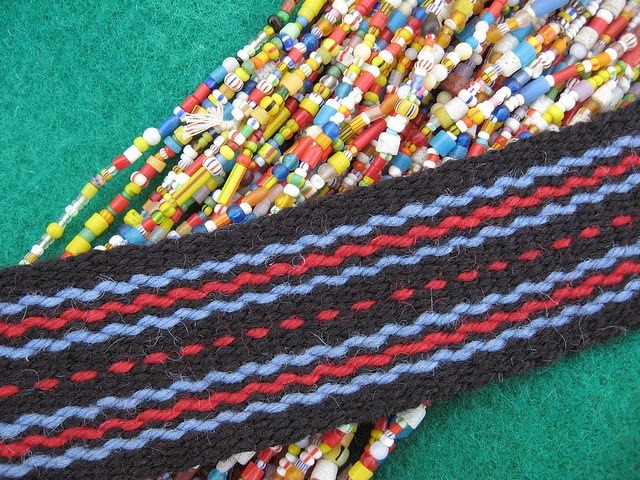 And here's an older wool sash which I made and always liked the particular shade of blue and how well it worked with the red and black. It's pattern draft looks like this. 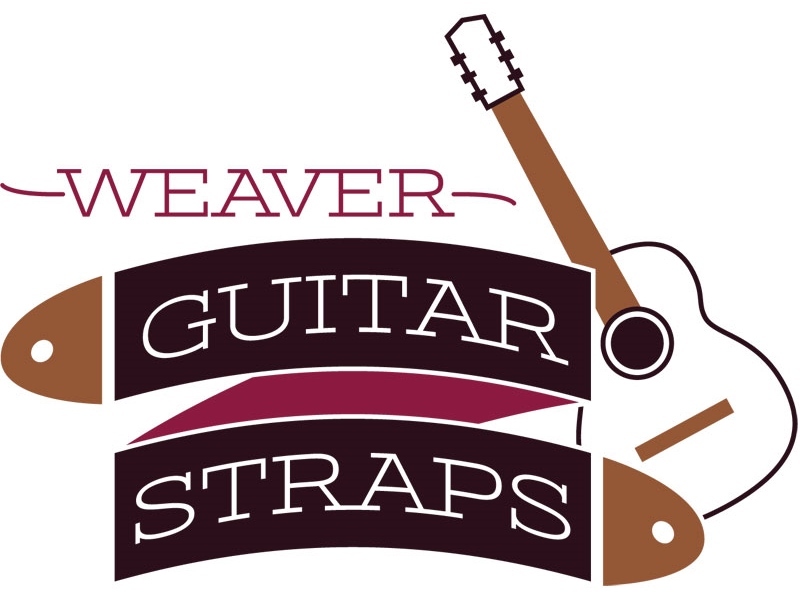 The guitar strap below is handsome with two shades of gray, light and dark combined with red and black. Sometimes a fourth color is just right, too. And it's pattern draft is below.